This Chicken with Mushroom and vegetables salad combines so much healthy benefits with just a hint of spice! The chicken in this recipe is a good source of protein and reduces cancer risk. Mushrooms are gaining the super food title for containing the most potent nutrients on the plant. Some of the nutrients mushrooms contain are vitamin B, vitamin D, potassium, and riboflavin. The bright and delicious corn adds a boost of more protein and keeps nerves and muscles healthy. Grate carrots. On medium heat sauté carrots with 1 Tablespoon of vinegar and 1/4 teaspoon of cayenne pepper for 5 minutes. 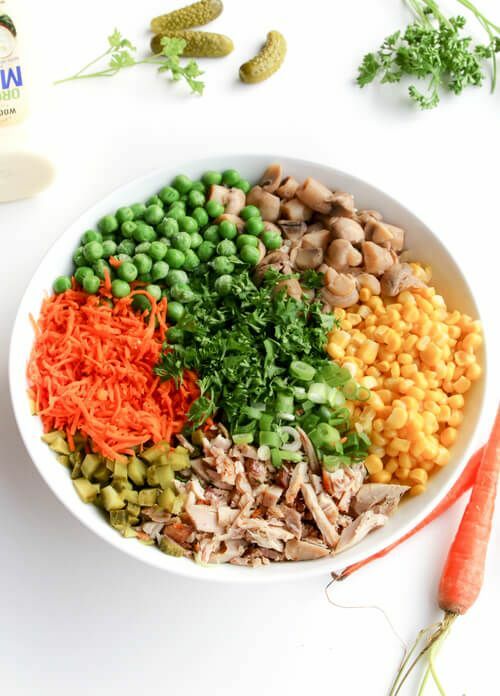 In a bowl, combine corn (drained), peas, shredded cooked chicken, chopped green onion, chopped parsley, chopped pickles, drained and chopped marinated mushrooms, and chopped carrots. When ready to serve, mix salad with 3 Tablespoons of mayonnaise.